Decals are a versatile form of product identification. Uses include product decoration, vehicle graphics, window graphics and warning markings for equipment. 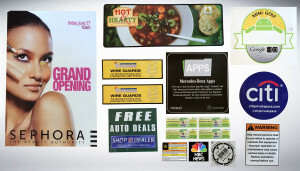 They are most commonly produced using pressure sensitive flexible vinyl or polyester. We also use products without adhesive such as static cling vinyl and magnetic material. The decals are printed using our silk screen or digital printing processes. The inks we use are both solvent resistant and outdoor durable. We are able to add an over-laminating film to the decals to provide increased durability. Decals can be cut into just about any shape required including individual lettering. In many cases, our digital cutting capability eliminates the need for tooling. When tooling is required, we are able to produce it in-house which offers us an advantage over many of our competitors. There are many different vinyl and polyester products available from manufactures such as 3M, Flexcon, Avery and Oracal. We are able to work with our customers to find the best solution for their requirements.